Mobile Log Cabin Specification & Design! Why are mobile log cabin specification and design different? Well in Europe this is largely down to the restrictions placed on the maximum sizes they can be due to the planning and building regulations they come under. The other main factor is the physical size of unit which can be transported on the roads. In North America the same criteria does not apply and mobile log cabin specs and design are largely down the logistics of physically transporting such a unit to the required site (which is much less restrictive there). With much wider roads and more space generally, larger units are much easier to move on the roads in America. So under European style legislation there is potentially a lot more compromise in your decision to go down the mobile route, in comparison to building a conventional log cabin. So why is a mobile log cabin specification not the same as a traditional log cabin? Well mobile units do not fall under the normal planning and building regulations in most European countries and hence the specification is usually significantly lower than a permanent log cabin. 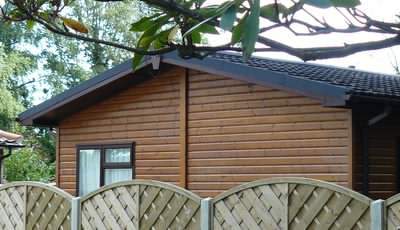 Unlike the real thing, mobile log cabins are usually not log at all, but are only merely cladding in a log profile finish to look like logs. Not only that, but usually the external cladding will be plastic (which is given a colour and appearance to look like real timber. Whilst it can look OK, it will never replicate the real appeal of actual logs. The upside is it won’t need painting and it is or course very light weight. It does however not have anything like the insulation value of logs or even timber cladding. It is possible however to get real log mobile cabins, but this is the exception rather than the rule! Internally flat boards with some type of plastic wipeable surface are usually used in holiday chalets. This is to minimize loss of internal space and to keep turnaround time down between rentals, when the cabins need cleaning. In homes internal finishes will be more varied, with some using plasterboard, wooden linings or other finishes. However most materials will be fairly lightweight and flat, to save on cost and space. In some case real logs can be used under mobile planning routes, if they meet size and transportation criteria. These will tend to be more costly (not massed produced) and are not found in any large numbers. The structure of most mobile log cabin walls is a thin timber frame construction, which normally means a much less sturdy wall than that which is built from a good thickness of log. Also the cavity which is left by this type of wall will often be less than that which you would use in a normal log cabin. Combining these factors means overall the insulation properties are likely to be inferior to a conventionally insulated log cabin and it will be much lighter and less robust too. Due to overall height restrictions and width restrictions, the roofs will be no thicker than is necessary and with a short span, the structure doesn’t need to be very large. Also the roof pitches tend to be very shallow to maximize the space internally, within the maximum allowed external dimensions. This will usually mean a very lightweight roof and roof tiles/covering and also less room for insulation than in a conventional log cabin. As already mentioned the cavities for insulation to go in tend to be much smaller, so therefore less insulation can be installed. Obviously there are certain higher performance insulation boards which are thinner, but they come at a cost and it is likely your mobile log cabin specification will dictate insulation values which below that you would normally find in a log cabin. Also bear in mind the large air gap under a mobile unit will tend to allow more cold too penetrate through the floor area. If you want to keep warm in cold weather, check your mobile log cabin specification carefully for insulation details! Disabled access and also minimum door and window sizes, do not apply in the same way to mobile units. Whilst this doesn’t have to be negative, usually doors will be narrow and access into rooms will be a tight. To save on space it is also likely that rooms will open into the main living area and there will be little or no hall or passage ways in smaller units. Windows and doors have come a long way in recent years. However it is likely that windows and doors in a mobile unit will be a thinner overall thickness and have lower insulation properties than conventional ones. 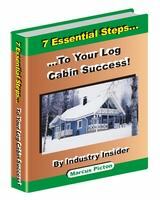 The single biggest difference in mobile log cabin specification is the base you can use it on. Most mobile homes will have a chassis which supports the structure of the unit and therefore proper foundations are not required. As long as stable, hard areas are supplied where the load is exerted to the ground and the site is flat enough, this will normally suffice. This saves a lot of time and money which is good. The downside is a floor which bounces as you walk across it. Remember some of the above factors may be mitigated if you are using a twin mobile home. 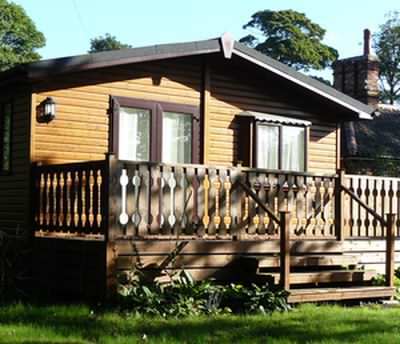 The extra space afforded helps to alleviate some of the common issues associated with mobile log cabins. There are also quite a few advantages to mobile cabins, such as cost, speed of installation, small plot area needed and the fact they can be moved. However you must appreciate a real log cabin does generally offer a superior level of specification. Always compare intelligently and research your mobile log cabin specification properly! Now a standard articulated lorry is 12 metres long and 2.4 metres wide. Whilst you can overhang loads by a certain amount without having police escorts etc, you certainly can’t get anything close to the maximum size. Any load size which is classified as exceptional and requires escorts and special traffic route plans, will greatly increase the cost and may limit possible site destinations which can be reached. Therefore in terms of holiday chalets probably only around half (or slightly less) the 6.8m width is likely to be achievable and so single mobile units will be pretty narrow (around 3m or less internally). The width is the single most critical factor for transport and therefore only by using a twin unit design can you get anything near the maximum width allowed. Twin units are much more likely to be used for homes, where as single units are used a lot for holiday cabins. Twin units are joined on site, by craning in place to 2 (or more) sections, which are then fixed together and cover plates installed over the joints. Twin unit designs do give much more design flexibility, however the overall height is quite low, (if you like vaulted ceiling which give a much more airy and open feel).